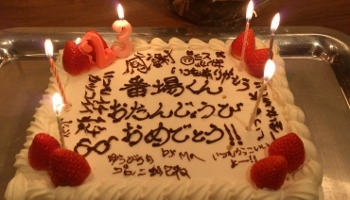 Today is the birthday of Baba-kun who joined our company in April this year. We celebrated it with this birthday cake covered with messages from us, senior colleagues. Bamba-kun always works very hard for our guests at Kamigamo shrine. Today, he was delighted by the gifts of sweets and pens from many guests. He is kind of a guy who works hard and earnest, but sometimes try to be cool with a poker face. And he is trusted by all the fellow planners.